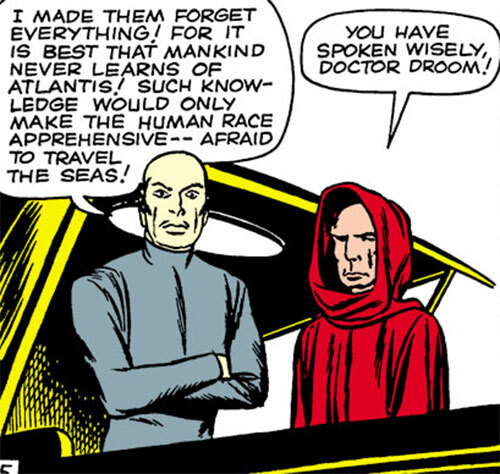 Doctor Droom is a very early Marvel character, who appeared in 1961. It didn’t work, and it aged badly. Yet he was in many respects the prototype for Doctor Strange (Stephen Strange), who appeared in 1963 once the “Marvel Age” was born. Doctor Droom would later be reinvented/retconned as Dr. Druid. However, this profile is purely about the vintage adventures of Doctor Droom, without any later material. Real Name: Dr. Anthony Droom. 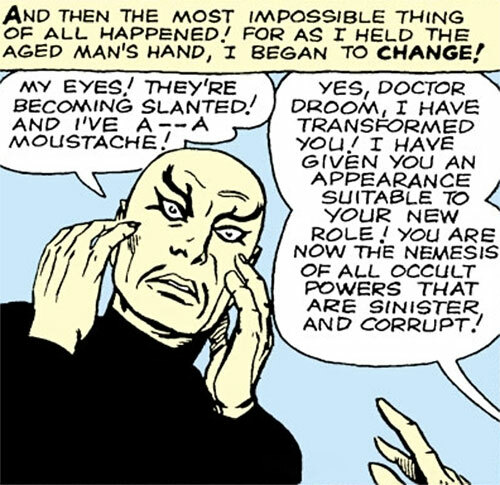 Dr. Droom is a rich and respected man, and nobody seems to mind that he has been magically turned into Fu Manchu’s kid brother. He is sometimes accompanied by Ramu, his assistant. Dr. Droom seems to be a superior physician with vast scientific knowledge. His deductions are always right no matter how improbable they seem. Hypnotism (sometimes supplemented with a gold medallion). A fakir-style rope trick (making a rope rise into the air and just remain stiff like a vertical, easily-climbable pole). Thought-casting (though it requires being in a deep trance). Projecting his voice as if it were coming from another spot. And a yogic technique to make his unmoving body as hard as metal. He demonstrated abilities as needed by the plot, so there are presumably others. Dr. Droom was an upper class American physician. While relaxing at the medical club, he overheard intrigued colleagues discussing the petition of a Tibetan lama, who had requested the presence of an American doctor. Fascinated by “Oriental mysteries”, Droom responded. Droom did reach the lamasery, lost high up among the Himalayas. There a curt attendant told him that he wouldn’t be paid for his services, and that he would only see his patients after overcoming a series of challenges. As it turned out, these included walking on burning coals and facing a lion/gorilla chimera. Having made it all the way to Tibet and considering himself bound by his oath, Droom overcame the trials. In so doing he realised that they were more tests of determination than genuinely dangerous ordeals. The lama then explained that he wasn’t sick per se, but extremely aged. His goal had been to find a worthy successor to continue his mystical fight against the forces of evil. Droom agreed to take on the lama’s burden, and the old man held the doctor’s hand as he died. Curiously, this physically transformed Dr. Droom, giving him exaggerated “Mysterious Oriental” features, with a moustache and odd eyebrows. The lama’s disciple then started training Droom in the mystical arts. Droom returned to the US, and soon gained a good reputation as an expert in occult mysteries. Thus, when the SS Luxuria, the world’s largest liner, disappeared, her owners came to consult with the good doctor. Dr. Droom discovered that she had been abducted by a hidden outpost of reptilian-looking, warlike Atlanteans. He hypnotised the Atlanteans into forgetting the existence of humans, and the Luxuria passengers into forgetting their abduction. Droom then returned the ship to the surface. A state governor later asked Dr. Droom to investigate Zemu, a very successful stage magician who had just entered politics and seemed poised for victory. Droom inevitably discovered that Zemu was an undercover scout from Saturn using alien technology to simulate magical powers. The good doctor then used mesmerism to force the would-be conqueror to surrender and confess. While on a lecture tour, Dr. Droom was called to investigate a spaceship that had just landed in nearby fields. Droom requested the largest construction derrick available, then hit the spaceship with a glancing blow of the wrecking ball. This done, he telepathically contacted the aliens. He greeted them in friendship but gave them the impression that he was the construction engine, rather than the man within. Thinking that Earth was populated by huge intelligent derricks the aliens, who were actually hostile, decamped in fear rather than accept Droom’s peaceful invitation. The police of the small town of Greenbirch then called Dr. Droom, as they were flummoxed by brand-new, unoccupied houses inexplicably vanishing. After the police received a ransom note, Droom reached the reasonable conclusion that the houses had been dimensionally shunted using super-science. Then, he investigated all scientists in the area. 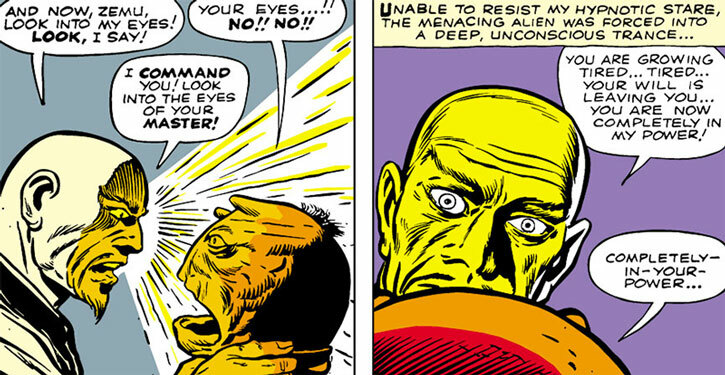 Of course, one of them turned out to be a disguised alien invader, who fled while promising a future revenge. A bald Mysterious Oriental™, usually dressed like a respectable early 1960s American businessman. (“Mysterious Oriental” being a reference to the way Asian people were being drawn in vintage comics, in case you’re young enough not to have been exposed to the terminology of these times. Though here the goal is to make the character look cool and exotic, it is… unfortunately dated. You can see our Jimmy Woo (1950s) article for more examples of art, and our Captain Nippon profile for a really, purposefully bad case). Anthony Droom is a cryptic loner. He is respected, charismatic and known for getting results, but routinely declines to explain what he feels mankind is not ready for. He’s thoroughly dedicated to protecting humanity against sinister threats, using his seemingly limitless skills and intelligence. Air-Walking requires a rope, is limited by the length of the rope, and can only be used to move vertically. Mystic Freeze is Elementally Linked to Hypnotism, and can only be maintained as long as Dr. Droom is hypnotising his subject. Skin armour can only be performed when staying completely immobile and concentrated. Telepathy can only be used for communication, and requires being in a deep trance. Buddy (Ramu the lama’s disciple), Familiarity (SCUBA diving), Iron Nerves, Sharp Eye. Magician’s Code, MIA toward Upholding his Hippocratic Oath. Gold medallion [BODY 01, Accuracy (Hypnotism): 07, Misc. : the Medallion confers an Area of Effect (everybody looking at the medallion) to Droom’s Hypnotism. 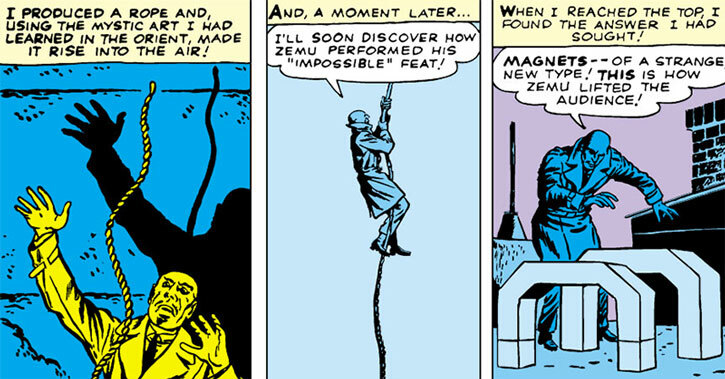 Fakir rope trick — Flight 1 (Levitation, Limited 1 (Requires a rope, limited by the rope’s length), Activation (Standard). Mesmerism — Will-resisted Affliction 8 (Entranced/Compelled/Transformed) Linked with Will-resisted Affliction 8 (Dazed/Immobile – limited degree). Both have Activation (Move). Yogi trance — Impervious Protection 6, Activation (Standard), Increased Action 3 (consumes all actions). Voice casting — Feature (can make his voice seem to come from somewhere also, range is about 10m). Psychic telepathy — Mental Communication 2, Comprehend Languages 3, Increased Action 3 (consumes all actions). Grants a Visual Perception Area of Effect bonus to his Mesmerism power. Defensive Roll 1, Improved Hold, Improved Trip, Redirect. Benefit 2 (Independently Wealthy), Fearless, Trance, Well-Informed. Athletics 2 (+3), Deception 3 (+5), Expertise (Science) 4 (+8), Expertise (SCUBA diving) 2 (+6), Insight 6 (+11), Perception 5 (+10), Persuasion 2 (+4), Stealth 6 (+7), Technology 4 (+8) (Limited 2 to Operations), Treatment 3 (+7), Vehicles 4 (+5) (Limited 1 to common land and sea vehicles). Code of silence Dr. Droom will often keep knowledge secret from ordinary men. Fight against darkness and evil Dr. Droom is sworn to oppose all evil, everywhere. Trade-off areas Attack/Effect PL 8, Dodge/Toughness PL 4, Parry/Toughness PL 4, Fort/Will PL 6. Point total 106. Abilities 40, Defences 11, Skills 17, Powers 16, Devices 13, Advantages 9. Equiv. PL 8. 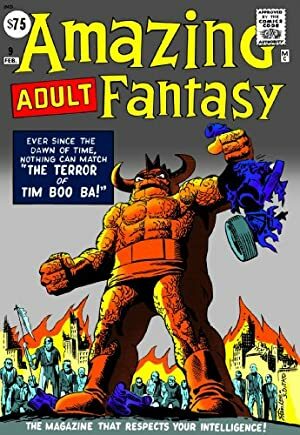 Source of Character: Amazing Adventures comics in 1961-1962. Writeup completed on the 4th of July, 2014.